Hey there PlayStation.Blog readers! My name is Michał “Luigi” Dobrowolski, and I’m a Senior Game Designer at CD Projekt Red. For more than a year now we’ve been working on our latest title, which I’m here to tell you more about here today. 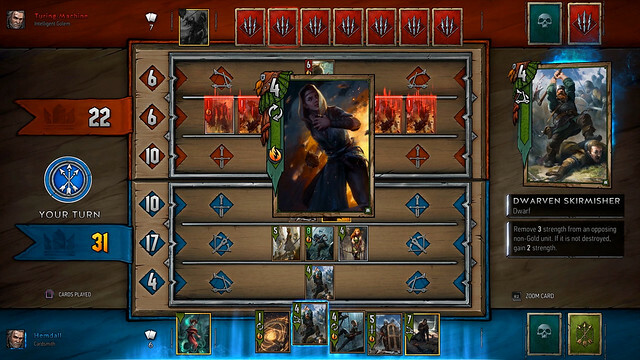 Gwent started out as a mini-game in The Witcher 3: Wild Hunt. During your adventure, characters you met along the road would sometimes invite or challenge you to play a friendly game of cards. But what was meant to be a fun addition to the story-driven open-world RPG unexpectedly became the main objective for many players. Following the release of Wild Hunt, we received hundreds of messages from fans asking us to create a standalone, multiplayer version of Gwent so they could play with friends. Some even made their own physical cards and boards. Seeing how passionate people are about Gwent, we decided to answer the call. Long story short, we started working on a fully-realized competitive card game called Gwent: The Witcher Card Game. It’s been a long road and lots of hard work, but we’re finally in Public Beta today, and with that the game is now available on PlayStation 4. 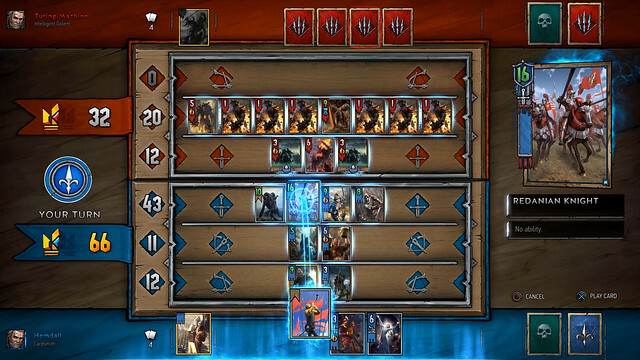 The basic concept of Gwent is simple. After creating an army consisting of characters, spells and other elements from The Witcher series of games, players from around the world clash in fast-paced duels against each other. Every match is a three-round affair that starts with you and your opponent drawing 10 cards from your decks. Each of you then play one card per turn onto a board divided into three rows: melee, ranged, or siege. To take home the game, you need to win two out of three rounds and to do that, you need to gather more points than your opponent does in each one. It’s everything that made the original Gwent feel fun and fresh, cranked up to 11 with the addition of multiplayer, ranked mode, new cards and abilities, and a complete visual overhaul. There are five playable factions to choose from: the mighty Northern Realms, proud and fearless Skellige, brutal Monsters, shadowy Scoia’tael and the cunning Nilfgaardian Empire. Each one feels and plays differently, and can employ a number of varied strategies based on the abilities available to them. For example, one of the ways to play Monsters focuses on them consuming their own units and gaining their power as a result. With Nilfgaard, you could create a strategy that relies on revealing enemy cards and controlling the battlefield using that knowledge. If you want to know more, we’ve prepared a set of videos describing playstyles of the different factions available in Gwent. You can check them out on the official YouTube channel of the game. Because a match plays across three rounds, choosing to forfeit a round is a viable strategy to gain an advantage for the next one. There’s no mana or other resources limiting what cards you can play when, so if you want to start the match by playing your strongest one, you’re free to do so. The one resource you have to keep in mind are the cards themselves, as you’re only guaranteed a limited number of additional cards each round. 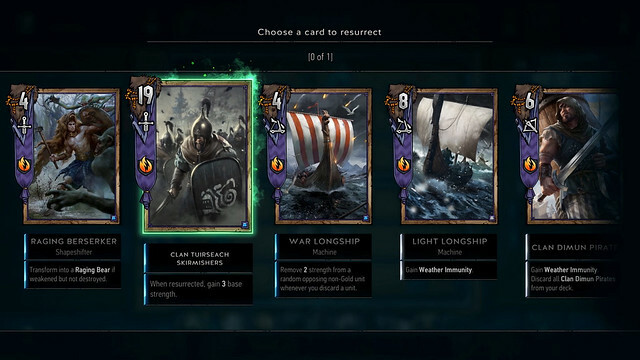 Having the ability to play units across three rows instead of one opens up a number of tactical options, too — for example, using the ability of the Geralt: Aard card to push a row of enemy units into one that’s consumed by a weather effect will cause the opponent to lose a lot of points. 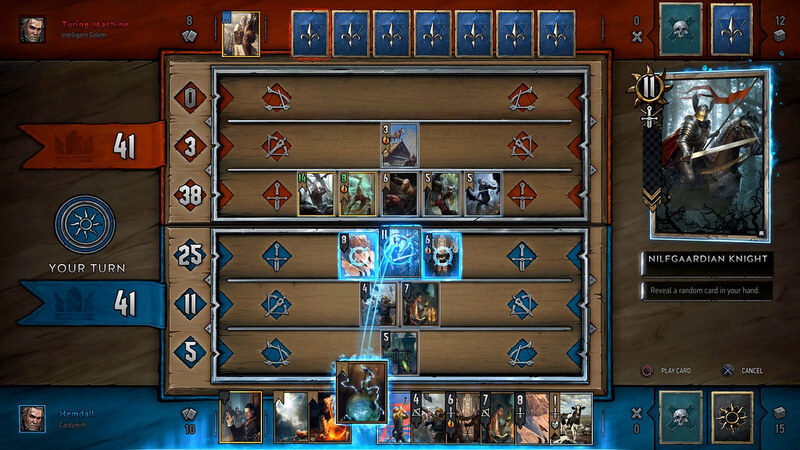 All of this makes Gwent a different kind of card game, where winning is based more on skill, strategy and quick thinking rather than blind luck. 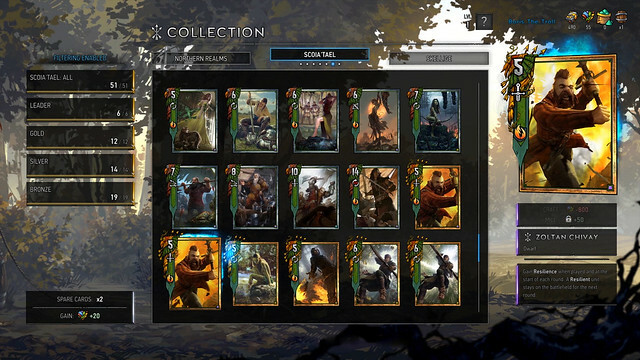 Something that was very important for us as a studio when working on Gwent was to make the cards the true heroes of the game. As a studio that loves to tell compelling stories and create beautiful visuals, each card was designed by our talented art team to be a miniature work of art and tell its own unique story. Every card has its own animated version, bringing each artwork to life. Whether it’s Geralt fighting a horde of nightmarish monsters, or King Foltest watching over his troops as they prepare for battle, these are actual animations, not just effects put on top of a 2D image. We’ve got a lot more planned for Gwent in the future, with one of the most exciting things we’re working on being single player campaigns. These won’t be simple challenges or opportunities to play cards, but brand new adventures set in the world of The Witcher, created by the same people who made The Witcher 3. Starring both new and returning characters from the The Witcher universe, each one will offer hours of story-driven content full of choice and consequence fans have come to love about our games. So, how about a round of Gwent? You can download the game right now from PlayStation Store for free. And if you’d like to give your PlayStation 4 some Gwent treatment, there’s a free theme and a set of profile avatars available, too! We hope you’ll enjoy playing The Witcher Card Game and please do let us know what you think in the comments here, or on Gwent’s official forums, Facebook, and Twitter. See you in the game!